Before the internet, television, even before movies, some of the first moving images were created with a tool called a zoetrope. Zoetropes create the illusion of motion from a group of still images that have small changes in them. They are typically cylinders with slits cut in the side. When the cylinder spins and you look through the slits, your eyes perceive the still images on the other side of the wall to be animated. The slits help keep the images from becoming a big blur, and the speed at which the images appear provide cause the images to appear to move. Originally, these novelties were spun by hand, or with a cranking mechanism. In this project, you’ll build your own zoetrope that animates a carnivorous plant. You’ll power the motion with a motor. To make this system even more advanced, you’ll add a switch that lets you control direction, another to turn it oﬀ and on, and a potentiometer to control the speed. In the Motorized Pinwheel Project you got a motor to spin in one direction. If you were to take power and ground on the motor and ﬂip their orientation, the motor would spin in the opposite direction. It’s not very practical to do that every time you want to spin something in a diﬀerent direction, so you’ll be using a component called an H-bridge to reverse the polarity of the motor. H-bridges are a type of component known as integrated circuits (IC). 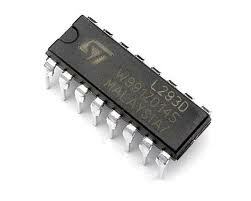 ICs are components that hold large circuits in a tiny package. These can help simplify more complex circuits by placing them in an easily replaceable component. For example, the H-bridge you’re using in this example has a number of transistors built in. To build the circuit inside the H-bridge you would probably need another breadboard. With an IC, you can access the circuits through the pins that come out the sides. 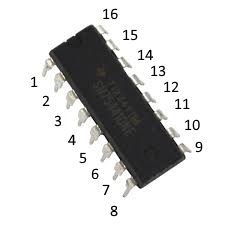 Diﬀerent ICs have diﬀerent numbers of pins, and not all of them are used in every circuit. It’s sometimes convenient to refer to the pins by number instead of function. When looking at an IC, the part with a dimple is referred to as the top. You can identify pin numbers by counting from the top-left in a “U” direction like in picture below. Zoetropes work because of a phenomena called “persistence of vision”, sometimes abbreviated to POV. POV describes the illusion of motion that is created when our eyes observe still images with minor variations in rapid succession. If you search online for “POV display”, you’ll find many projects made by people that leverage this eﬀect, often with LEDs and an Arduino. 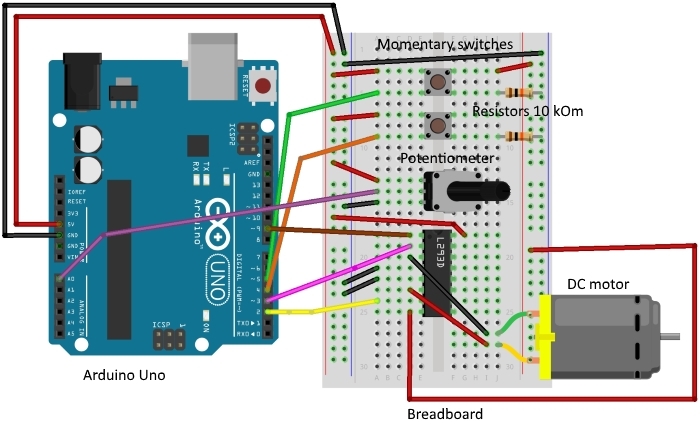 Connect power and ground from one side of your breadboard to the Arduino. 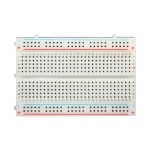 Add 2 momentary switches to the breadboard, connecting one side of each to power. 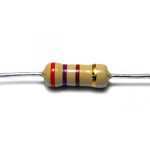 Add a 10Kohm pull-down resistor in series with ground on the output pin of both switches. The switch on pin 4 will control direction; the switch on pin 5 will turn the motor on and oﬀ. 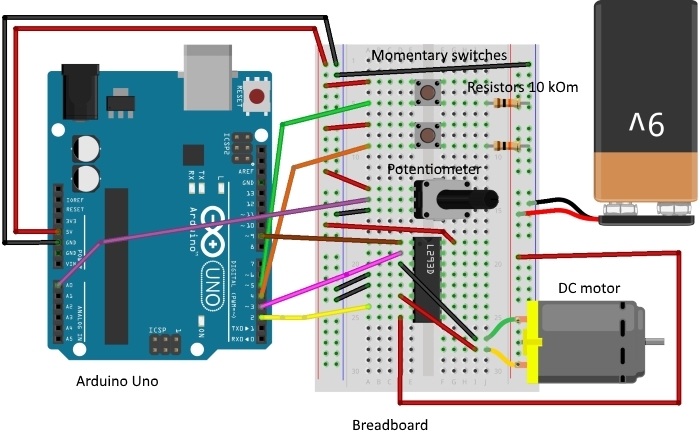 Connect the potentiometer to the breadboard. Wire 5V to one side and ground to the other. 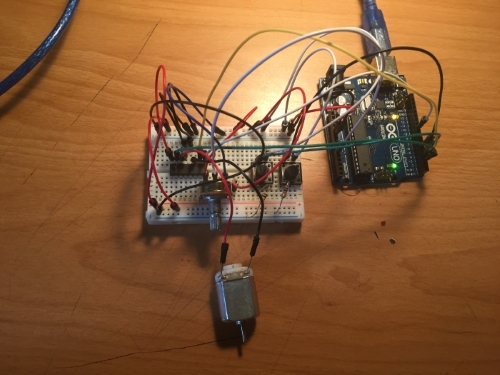 Attach the center pin to analog input 0 on the Arduino. This will be used to control the speed of the motor. Place the H-bridge on your breadboard so it straddles the center. Connect pin 1 of the H-bridge to digital pin 9 on the Arduino. This is the enable pin on the H-bridge. When it receives 5V, it turns the motor on, when it receives 0V, it turns the motor oﬀ. You will use this pin to PWM the H-bridge, and adjust the speed of the motor. Connect pin 2 on the H-bridge to digital pin 3 on the Arduino. Connect pin 7 to digital pin 2. These are the pins you will use to communicate with the H-bridge, telling it which direction to spin. If pin 3 is LOW and pin 2 is HIGH, the motor will spin in one direction. If pin 2 is LOW and pin 3 is HIGH, the motor will spin in the opposite direction. If both the pins are HIGH or LOW at the same time, the motor will stop spinning. The H-bridge get its power from pin 16, plug that into 5V. Pins 4 and 5 both go to ground. Attach your motor to pins 3 and 6 on the H-bridge. These two pins will switch on and oﬀ depending on the signals you send to pins 2 and 7. Plug the battery connector (without the battery attached!) to the other power rails on your breadboard. 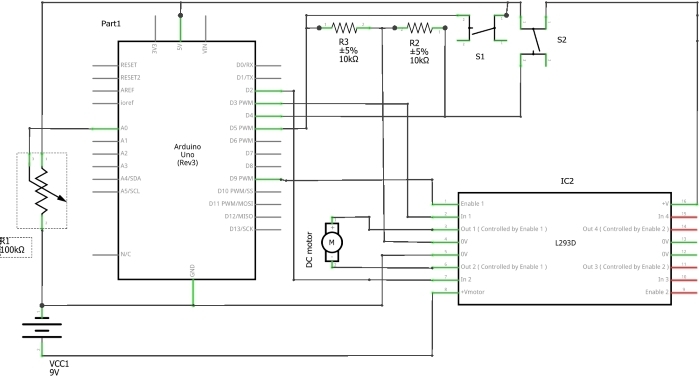 Connect ground from your Arduino to the battery's ground. Connect pin 8 from the H-bridge to the battery power. This is the pin that theH-bridge powers the motor from. Make sure you do not have your 9V and 5V power lines connected. They must be separate, only ground should be connected between the two. Create constants for the output and input pins. Use variables to hold the values from your inputs. You’ll be doing state change detection for both switches, comparing the state from one loop to the next, similar to the Hourglass Project. So, in addition to storing the current state, you’ll need to record the previous state of each switch. motorDirection keeps track of which direction the motor is spinning, and motorPower keeps track of whether the motor is spinning or not. In setup(), set the direction of each input and output pin. Turn the enable pin LOW to start, so the motor isn’t spinning right away. In your loop(), read the state of the On/Oﬀ switch and store it in the onOﬀSwitchState variable. If there is a diﬀerence between the current switch state and the previous, and the switch is currently HIGH, set the motorPower variable to 1. If it is LOW, set the variable to 0. 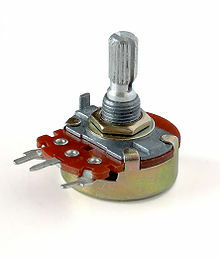 Read the values of the direction switch and potentiometer. Store the values in their respective variables. Check to see if the direction switch is currently in a diﬀerent position than it was previously. If it is diﬀerent, change the motor direction variable. There are only 2 ways for the motor to spin, so you’ll want to alternate the variable between two states. One way to accomplish this is by using the inversion operator like so: motorDirection =!motorDirection. The motorDirection variable determines which direction the motor is turning. To set the direction, you set the control pins setting one HIGH and the other LOW. When motorDirection changes, reverse the states of the control pins. If the direction switch gets pressed, you’ll want to spin the motor in the other direction by reversing the state of the controlPins. If the motorEnabled variable is 1, set the speed of the motor using analogWrite() to PWM the enable pin. If motorEnabled is 0, then turn the motor oﬀ by setting the analogWrite value to 0. Before exiting the loop(), save the current state of the switches as the previous state for the next run through the program. Plug your Arduino into your computer. Attach the battery to the connector. When you press the On/Oﬀ switch, the motor should start spinning. If you turn the potentiometer, it should speed up and slow down. Pressing the On/Oﬀ button another time will stop the motor. Try pressing the direction button and verify the motor spins both ways. Also, if you turn the knob on the pot, you should see the motor speed up or slow down depending on the value it is sending. Once you’ve verified that the circuit works as expected, disconnect the battery and USB from the circuit. In order to build your zoetrope, you must take the pinwheel you used before and the cutout with the vertical slits that is included in your kit. Once the CD is securely attached to the shaft of the motor, plug everything back in. Hold your project up, so you can look through the slits (but make sure the CD is secured to the motor, and don’t get too close to it). You should see the sequence of still images “move”! If it is going too fast or too slow, turn the knob of the potentiometer to adjust the speed of the animation. Try pressing the direction switch to see what the animation looks like when played backwards. Make a base to support the motor. A small cardboard box with a hole cut in it could work as a base, leaving your hands free to play with the switches and knob. This will make it easier to show oﬀ your work to everyone. With a little work, you can get your zoetrope working in low light situations as well. Hook up an LED and resistor to one of your free digital output pins. Also add a second potentiometer, and connect it to an analog input. Position the light so it shines on the images. Using the analog input to time the ﬂashes of the LED, try and time it so the light ﬂashes when the slit is in front of your eyes.